This May's European Parliament elections are expected to bring about a new all-time record -- not in voter turnout, not in enthusiasm for European institutions, but in support for right-wing, anti-immigrant, and anti-EU fringe parties. In many countries on the old continent, extremist parties have been on the rise and radical ideas are gaining traction. In the Netherlands, where liberalism and tolerance have historically been embraced like in no other country, Geert Wilders and his “Freedom Party” have been propagating an anti-immigrant agenda specifically aimed at Muslims. The party came in third in the Dutch parliamentary election in 2010 and effectively caused the government to collapse in 2012 by withdrawing its support from the ruling coalition. The Danish government, pressured by the far-right Danish People's Party, reintroduced border controls a few years back, a concept that directly violates the EU's principle of free movement. In a similar move, the Swiss People's Party led the historically tolerant country to introduce quotas on immigration after a controversial referendum passed by a slim margin this past February. A few years back, the same Swiss populist movement introduced a construction ban on new minarets, the traditional Islamic prayer towers that loom over mosques. In France, Marie Le Pen’s National Front performed exceptionally well in municipal elections last March, foreshadowing a repeat performance in the European Parliament elections. A strong showing would enable it to coalesce with likeminded nationalist parties like the Austrian Freedom Party, the Belgian Vlaams Belang, the Italian Northern League, and the Swedish Democrats, among others, to make up the strongest nationalist coalition this relatively young legislative institution has seen thus far. An analysis of the socioeconomic and political situation in Europe reveals that, as in the 1930s, the current rise of far-right nationalism in Europe is a direct result of two mutually reinforcing forces: economic hardship and a perceived infringement on state sovereignty. The trend toward right-wing extremism during the 1930s was much stronger than today, but so was the economic hardship. The rise of the Nazi party in Germany in the late 1930s has long been attributed to the economic impact of the Great Depression, the hyperinflation of the German currency, and the fact that Germany -- blamed for the entirety of the Great War -- was forced to pay billions of dollars in reparations to the Allies. Hardworking Germans, accustomed to their country enjoying the status of a great power with a thriving economy, suddenly found themselves having to shuttle wheelbarrows full of money just to buy a loaf of bread. The destitution was unbearable, and opportunistic polemicists went out in search of scapegoats: first, the foreign powers imposing the hardship, and second, the European Jews who, according to right-wing propagandists, stabbed Germany in the back during World War I. The political environment created unique opportunities for nationalist parties peddling xenophobia alongside state sovereignty. Today's nationalist fringe parties thrive on the same two principles. The Great Recession has hit Europe hard, and external institutions are imposing harsh conditions on the countries impacted. Greece is a prime example. Having taken an extreme economic hit, Greece is dependent on foreign “bailout” funds to pay its debts. In return, a “troika” consisting of the International Monetary Fund (IMF), the European Central Bank, and the European Commission has imposed brutal austerity measures, including tax increases, the elimination of subsidies, cuts to social programs, and layoffs in the public sector. Certainly, Greece has a record of poor budgeting and financial mismanagement, but the austerity regime is no remedy for the people on the ground. Hard-earned salaries and pensions have been cut, public sector workers once considered safely employed have been laid off, and suicide rates are spiking. 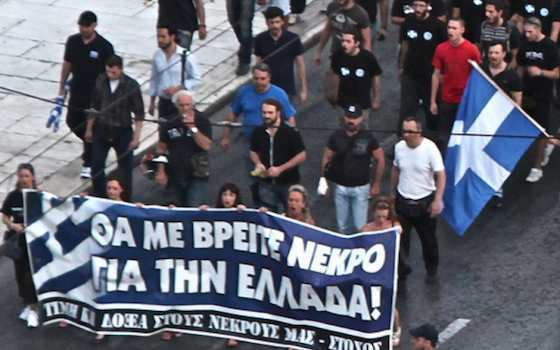 Capitalizing on the sour public mood, Greece’s far-right Golden Dawn party has viciously attacked Greek communists and immigrants and railed against external European institutions -- and many Greeks have been listening. On the other side of the spectrum are the countries that are performing relatively well, Germany being the prime example. Germany's economy is perhaps the healthiest in Europe, but its financing of bailout packages for its less affluent neighbors has sown resentment among Germans who believe that their tax dollars are perpetuating and rewarding the financial mismanagement of others. Social benefits in Germany have been dropping drastically in recent years under economic and political pressure. Meanwhile, nostalgic stories from the elder generation make younger Germans wonder where all the money went. In the good old days, everyone in Germany was guaranteed retirement, there was no copay for doctor's visits, and even working-class Germans received a “13th paycheck” as a Christmas bonus. The popular conclusion, erroneous yet widespread, is that these are precisely the funds that are now financing the bailouts of others. And to top it all off, the Schengen agreement allows for the migration of EU citizens from poorly performing countries to those that are doing well, leading to a perceived exploitation of the generous social welfare benefits of the more affluent states like Germany, further depleting state coffers. It is this kind of thinking that contributes to the relative success of anti-multicultural publications like Thilo Sarrazin's bestseller Deutschland schafft sich ab, or Germany Does Away with Itself. Thus, for right-wing parties in well-off and poor states in Europe alike, the political impulse appears to be the same: resorting to nationalism and blaming the European Union. Europe's problem is partially anchored in perception. Many Germans fulminate against the euro, and the country's own anti-Europe party -- the AFD, or Alternative for Germany -- is advocating the abandonment of the common currency. But the truth is that the euro has been extraordinarily good for the export-oriented country. Disappearing trade barriers and the ease of currency exchange have allowed German products to penetrate more markets, while the poor economic performance of countries like Greece has kept the euro artificially low, making German products even more desirable due to affordability. Similarly, many Greeks assign the blame for their country's poor economic performance to Angela Merkel for imposing harsh austerity conditions on the shaky Greek economy instead of acknowledging the many years of prior financial mismanagement by the Greek government. While there is ample room to cooperate and find a middle ground, democratically elected leaders in both the poorly performing and the well-off economies in Europe have little choice but to cater to the voices of discontent if they want to be reelected. For Europe's strong economies, a rescue of the weak carries many benefits, such as the retention of the common currency and ease of access to the European single market. The weaker states, too, benefit from Europe and the single market, and even the painful restructuring of their respective economies could prove beneficial in the long run (though it should take place over a longer period of time and not in the form of austerity shock therapy). But Europe's biggest problem is identity. While Europeans have often shown a willingness to make sacrifices to bail out their own compatriots, the willingness to bail out others or to cut back for the common good of the union is just not there. For instance, German pension funds, the health care system, and the access to free education are prime examples of redistributing wealth to promote the greater good. But Greeks and Spaniards are not Germans, and the perception of the all-inclusive “European citizen,” no matter how real on paper, does not yet exist in the minds of the masses. Similarly, while many Greeks will concede the need for fiscal reform, the imposition of harsh austerity measures by outsiders has amplified Europhobic sentiments in the country and caused a backlash against already marginalized populations like immigrants. For all the efforts European leaders have undertaken to foster a common European culture, the speed of European integration by far supersedes the speed of cultural integration. European integration is a good thing, and if properly pursued it will continue to raise the living standards of all involved. But perhaps it is time to consider slowing down the speed at which it has been progressing to give European culture time to catch up. Stefan Haus is an analyst and a government consultant in Washington, DC. He graduated with a BA in Political Science and an MA in International Studies and focuses his work on matters pertaining to national and international security. Andrew Hussey, "The French Intifada: The Long War Between France and Its Arabs "
"The Right Rises Again in Europe"